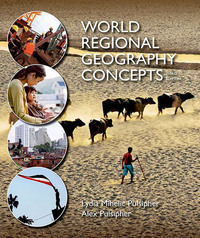 World Regional Geography Concepts 3 Edition Filled with the rich diversity of human life, yet exceptionally concise, World Regional Geography Concepts humanizes geographic issues by representing the daily lives of women, men, and children in the various regions of the globe. As in their more comprehensive text, World Regional Geography, Lydia and Alex Pulsipher make global patterns of trade and consumption meaningful for students by showing how these patterns affect environments and people at the local level. And at around 450pages, it remains the ideal length for covering all of the world’s regions in one semester.The new edition offers more streamlined and consistent chapter structure, a wealth of new information and images, and its own dedicated version of LaunchPad, W.H. Freeman’s new online course space featuring a fully integrated e-Book, LearningCurve adaptive quizzing, a rich collection of student media resources, and easy setup, assessment, and course management options for instructors. To order this book packaged with LaunchPad please order package isbn 978-1-319-01720-0.